# Blend the mixture of the sugar and the eggs until it reaches to the consistency of cream. # Add all of the ingredients except prunes in it, and mix until get a smooth mixture. # Finally add the seeds removed and sliced into 4-5 pieces into the mixture, stir the mixture gently to get a smooth mixture. # Bake in 356 F oven for about 45-50 minutes. # Remove the seeds of the prunes and blend to get it puree, add castor sugar in it and cook it to boil it for a few seconds, add vanilla. 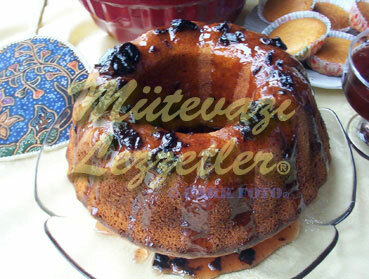 # Reverse the cooled cake after removing it from the oven, and pour the mixture of prune all over the cake. Rest it for a while and serve. Note: The taste of this cake is a little bit sour.